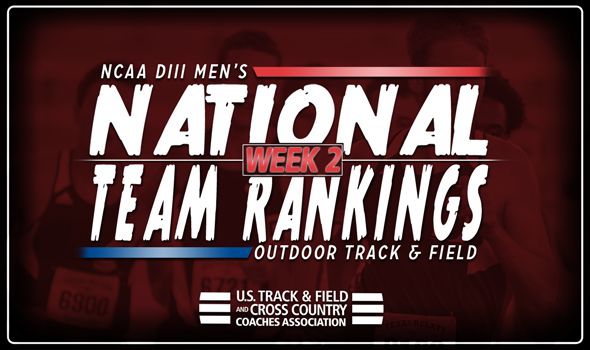 NEW ORLEANS – While nothing changed in the top-5 of the NCAA Division III Men’s Outdoor Track & Field National Team Rankings between Week 1 and Week 2, the same couldn’t be said for the rest of the top-10. The most recent rankings, which were released Tuesday by the U.S. Track & Field and Cross Country Coaches Association (USTFCCCA), saw two teams shake up the upper echelon of the index: Mount Union and Benedictine (Ill.). The Purple Raiders come in at No. 6 this week, which is their best outdoor ranking in the past three years. Mount Union sits behind No. 1 North Central (Ill.), No. 2 Rowan, No. 3 George Fox, No. 4 Augustana (Ill.) and No. 5 St. John Fisher. Matt Keim played a major role in helping the Purple Raiders climb six spots as he notched one of the best parks in the pole vault on the young season (5.04m/16-6½). The Eagles have seven marks ranked in the top-10 nationally and moved up two spots from No. 9 to No. 7. Benedictine (Ill.) has a strong core consisting of Matt Fleming, Roman Hill, Jordan Johnson and Luther Newburn. Outside of the top-10, the biggest improvements of the week were made by Trinity (Texas) and Berea (Ky.). The Tigers jumped from No. 32 to No. 17 after its 4×100 team clocked the second fastest time in NCAA DIII this season (41.53) and Matt Love hurled the discus 52.60m (172-6) for the No. 5 spot in the USTFCCCA Individual Rankings. Logan McKenzie paced the Mountaineers as he notched the top spot in both the NCAA DIII Descending Order List and in the USTFCCCA Individual Rankings in the steeplechase.